Most New Yorkers recognize the New York Road Runners as the organizers of the ING New York City Marathon, one of the largest marathons in the world. But did you know that NYRR is dedicated to providing running programs for kids, too? On October 23rd, NYRR will host their semi-annual Youth Jamboree at the New Balance Track and Field Center at the Armory in upper Manhattan. These Jamborees, which feature track and field events for children from kindergarten through 8th grade, are open to any child who registers. Against the backdrop of the running, jumping, and throwing events, NYRR will offer a family health fair. For more information or to register your child, visit NYRR’s website. NYRR’s other youth programs are worth investigating as well. 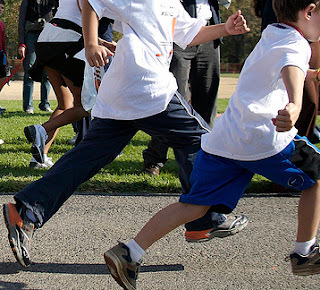 Mighty Milers promotes fitness by encouraging kids to integrate exercise into their daily lives. Participants can track their progress online and work toward incentives provided by NYRR. Young Runners is a free program for kids in elementary school up through high school. Kids can join a running team and enjoy regular coaching sessions, entry into races, and more. Young Runners is available to schools, churches, or other organizations. Visit NYRR’s homepage for even more opportunities to help kids get moving.